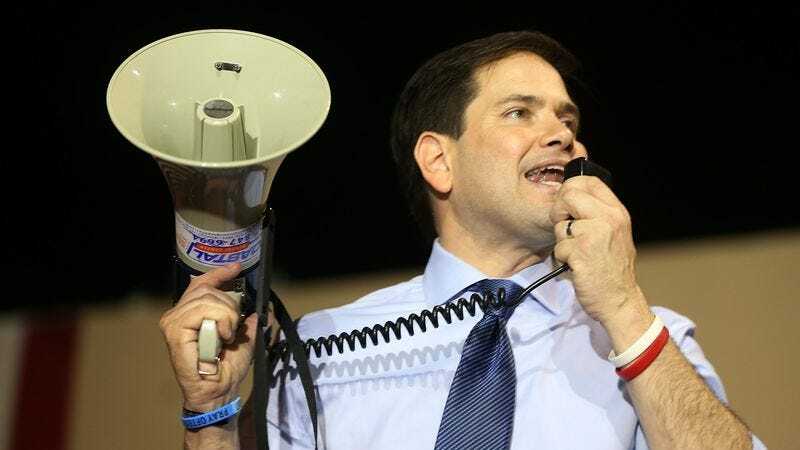 Amid a tumultuous moment in American politics, in which the Trump administration has banned Muslims, lied repeatedly about its Russian ties, launched paranoid fantasies about sitting presidents ordering wiretaps and spying on citizens through their microwaves, and begun implementing a healthcare plan that will leave 24 million people in the cold, Marco Rubio has finally had enough. Yesterday, the Florida senator defiantly stood up against these growing threats to our nation, issuing a stern statement that spelled out, in no uncertain terms, that Snoop Dogg shouldn‘t have made a video where he pretends to fire a toy gun at a Donald Trump lookalike. “People can disagree on policy, but we’ve gotta be very careful about that kind of thing, because the wrong person sees that and gets the wrong idea, you could have a real problem,” said Rubio, who has repeatedly shown he’s unafraid to tangle with his own ideological opponents in this manner, as when he faced then-nominee for Secretary Of State Rex Tillerson and held his feet to the fire over his friendship with Russian “war criminal” Vladimir Putin, reminding Tillerson of the many political dissidents and journalists who had been murdered under Putin’s regime, and steadfastly refusing to accept Tillerson’s waffling, before finally giving Tillerson his full endorsement. “I’m not sure what Snoop was thinking. He should think about that,” Rubio said, courageously condemning the rapper with his suggestion that he should probably stop and reconsider whether he might be encouraging someone to kill the president, something which would certainly raise some questions. Yes, lots of troubling questions there that might force Marco Rubio to rethink his position on whether he will confirm Snoop as part of his Spotify hip-hop playlist, though any final decision there will obviously depend on his talks with other GOP members. Concluding his fiery remarks, Marco Rubio then ran away as fast as he could before someone asked him a real question.